The 9 Easy Baking Recipes for Homemade Ingredients free eCookbook is a fabulous collection you'll want to keep close as Valentines time draws near, not to mention all year round. If you're a baker, everyone looks forward to the super sweets you whip up. Parties, work events and family gatherings are great opportunities to show off your skills by baking countless cookies, brownies, cakes and more. AllFreeCopycatRecipes.com presents a list of homemade ingredients that make any creation even more "from scratch". How often can you say "I made my own butter"? Now you can and it will knock the socks off your guests. Shine bright like the season with this clever collection of make-at-home bakery ingredients. These brand name, homemade easy baking recipes are fun to recreate at home and allow you to save some “dough”—in your wallet, that is! Think of the long list of ingredients you normally buy at the store. Any of those items could be made at home! Thanks to our free eCookbook, 9 Easy Baking Ingredients for Homemade Ingredients, you can enjoy a variety of copycat homemade baking recipes. You will love them and so will the members of your family joining you to taste test your latest creations! 9 Easy Baking Recipes for Homemade Ingredients features some of the most unique copycat recipes around, which also happen to be our readers’ favorite recipes as well. In this free eCookbook you’ll find recipes Homemade Butter (p. 6), Homemade Mascarpone (p. 11), Homemade Vanilla Extract (p. 13) and many more perfect baking recipe ingredients! Next time want to bake up brownies, cookies, cupcakes or anything else, consult our free eCookbook. Download your copy of 9 Easy Baking Recipes for Homemade Ingredients today. The key to any good baking recipe are great ingredients. Why not ensure quality by whipping up some of your own homemade ingredients? The 9 Easy Baking Recipes for Homemade Ingredients eCookbook features tips and tricks for making homemade butter (butter) and also for homemade strawberry butter, if you're looking to add a special touch to any easy holiday gift recipe. These step-by-step simple baking recipes will help make you a homestyle pastry chef in no time. 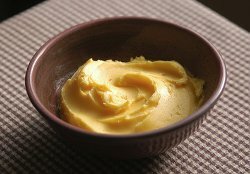 Easy Baking Recipes for Butter are essential because they create the base for any quality baked good. What's your dream dessert? Are you partial to cookies, bars, pastries or something extra special? Starting the recipe off with your very own butter is a fun way to really explore the baking process. Whether you are a novice baker or you are starting on baking nearly your millionth cake, the recipes in this free eCookbook, 9 Easy Baking Recipes for Homemade Ingredients, are sure to give you inspiration for all of your easy baking creations. In French, the name for someone who makes cheese is a "fromagier". Fancy yourself a real life "fromagier" with these easy baking recipes for cream and cheese. Adding your very own homemade cheese to any baked good will make the recipe sing. In our free eCookbook, 9 Easy Baking Recipes for Homemade Ingredients. 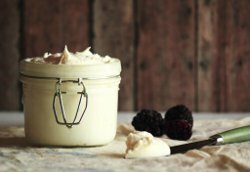 For a cheap and easy cheese option, grab your cheese cloth and get started making some Homemade Mascarpone (pictured). What would normally cost a pretty penny in the grocery store, you can make the homemade version for only two dollars. Also, try your hand at making Homemade Whipped cream to add a little homestyle flair to any dessert. Take out your favorite apron and get started with the recipes in 9 Easy Baking Recipes for Homemade Ingredients and let this inspiration be your guide. Who knows, you could create something truly unforgettable! Download your copy of 9 Easy Baking Recipes for Homemade Ingredients. Next time you’re creating a list of ingredients to creat the perfect dessert, consider making some of these brand name, easy baking recipes at home. Famous baking ingredients are a snap to recreate at home, whether you're in the market for homemade butter, cheese, cream and anything else you can dream up. Easy cheap baking recipes recipes and dessert ideas are right at your fingertips with our free eCookbook, 9 Easy Baking Recipes for Homemade Ingredients. All right, so now that you've browsed some butter and cheese baking recipes, take a look at the rest of the wonderful recipes for these 9 Easy Baking Recipes for Homemade Ingredients. If you ate Marshmallow Fluff as a kid, you will definitely get a kick out of the make at home version. 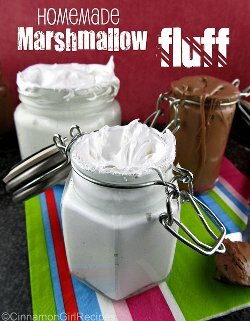 For an extra special treat, try making Homemade Marshmallow Fluff, chocolate flavored! Simple baking recipes should be just that....easy and uncomplicated, like one of the book features, DIY Pumpkin Pie Spice. Just gather a few simple spices, combine and you have a special treat with sophisticated flavor. If you want to recreate a little bit of the magic of a Starbucks-like latte but don't feel like shelling out 4 dollars, add a little bit of Homemade Salted Butter Caramel Sauce. It's great. Also, step up any batch of cookies by creating your very own Homemade Vanilla extract. If you're looking to make a big impression, dazzle your guests with these great baking recipes. If you love warm and comforting recipes, these basic recipes will help you build the ultimate baked goods. These recipes are a great jumping off point for creating a truly fulfilling dessert and treat menu. Enjoy everything with abandon and take notes from this made-for-you free eCookbook, 9 Easy Baking Recipes for Homemade Ingredients. Download your copy of 9 Easy Baking Recipes for Homemade Ingredients! This time of year I love to bake anything that has pumpkin in it. Somethings the matter with your Homemade Butter recipe. In the description beside the picture, it says that 'seltzer water' is used, but it's not listed in the Ingredients. In the #1 Instructions, it says to put the 'milk and butter' in a saucepan and heat till the butter is melted. In the Ingredient list, there is no milk or butter listed. What's up with that? Don't the recipes even get proof-read and edited for correctness? When I read the instructions, the butter recipe didn't have the seltzer water in the ingredients nor mentioned it in the instructions. In the instructions, it did say to put butter (no amount in ingredients) in with milk and shake. Having made butter from separated goats milk, I would say, no butter is needed when shaking the milk. I don't see how butter helps make butter. The butter recipe states that you need heavy cream, seltzer water and salt, but when you follow the instructions,it starts off telling you to put the milk and butter into a saucepan and stir until the butter melts. Also, there is nowhere in the rest of the instructions mentioning that seltzer ingredient that was referred to as one of the items needed. Something wrong with directions for whipped cream.....add chicken broth and bread??? ?